This popular book is amongst the most comprehensive textbooks on health care management available. Written with health care managers, professionals and students in mind, it provides an accessible guide to health care systems, services, organisations and management. Key areas include: allocating resources for health care: setting and managing priorities; health technologies, research and innovation; internationalisation of health systems and policies; health care services: structure and delivery; chronic disease and integrated care; health care leadership and networks: incentives, governance and performance. The new edition features an updated structure to support teaching and learning and thirteen new chapters which draw upon a wealth of experience from leading international experts in the field. This includes references to practical policy and case study materials, chapter summaries focusing on key points, self-assessment learning exercises, further reading and links to useful web-based resources. 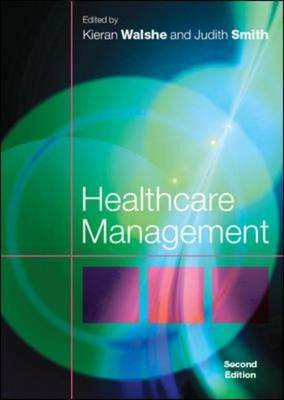 Healthcare Management is valuable reading for students and healthcare professionals involved in management, research and health policy making. The links between the theory and practice of healthcare management are skilfully explored and the authors show how best practice within healthcare systems can be maintained. Contributors: Vidhya Alakeson, Ruth Boaden, Jeffrey Braithwaite, Iain Buchan, Mirella Cacace, Naomi Chambers, Elaine Clark, Helen Dickinson, Jennifer Dixon, Barrie Dowdeswell, Jon Glasby, Scott Greer, Anthony Harrison, Paula Hyde, Valerie Iles, Ann Mahon, Russell Mannion, Anne McBride, Andrew McCulloch, Shirley McIver, Matt Muijen, Ellen Nolte, James Raftery, Suzanne Robinson, Rebecca Rosen, Judith Smith, Helen Sullivan, Anne Tofts, Kieran Walshe, Andy Wilkes, Iestyn Williams, Juliet Woodin and Steve Wright. "This is an outstanding book that provides the concepts and tools necessary to enable healthcare managers and policy makers to build better health care systems. The book maintains the strengths of the first edition ...and adds new chapters and updated content throughout to make the book more international and comprehensive in its coverage of topics." (Tom Rundall, Professor of Organised Health Systems, University of California at Berkeley, USA). "This book covers the main areas of knowledge which managers need, and gives tools for thinking and empirical examples relevant to current challenges. Evidence based management might not always be possible, but this book gives a way for a manager to become research-informed and therefore more effective." (Professor John Ovretveit, Director of Research, The Karolinska Institute, Sweden).